Ted St. Martin has written a highly personalized 106-page account of his world record-breaking shooting achievements, which he began in 1972, and related advice on shooting the basketball ranging from free throws to dunks to three pointers. His main theme – the idea that you “don’t have to be a great player to be a great free throw shooter” – can bring hope to every player. His helpful suggestions and instructions are wisely combined with helpful visuals, except in one of the later chapters, the drills section. Inspiration flows steady in this book as the author drops plenty of famous basketball player names and describes his life experiences. This Floridian has spent more than 35 years facilitating clinics and teaching basketball players shooting and skill fundamentals. One of his featured shots, the traditional hook, pales in comparison to the lightning quick jump hook, which makes the book a bit dated. The high percentage hook shot has become so familiar that most players can predict the initial step motion and reach around to steal the ball before the shot. St. Martin concedes that his shooting situations don’t always mirror actual game situations while laying down some very honest assessments of the current state of the game. He comments how players must understand what they’re doing wrong with their shot, but forgets to offer even one simple solution like setting up a camera to videotape the shot. This experienced author still, however, has plenty of golden rules to fill a player’s mind. For examples, his advice to always concentrate on the back of the rim (not the path of the ball) when shooting can be especially helpful. St. Martin feels anything less than 85% free throw shooting average in the NBA is a “disgrace” and challenges readers to work to perfection. This mantra mainly applies to individual work outside of practice and games. Here the author should suggest entering contests with crowds present (e.g. the annual Knight of Columbus free throw contest, etc.) to mirror game situations. In organized basketball leagues, the time spent on free throw shooting is minimal (though most coaches wisely have free throw drills at the end of practice to simulate game fatigue). Players, especially younger ones, often have more mental pressure remembering set plays and the player they’re guarding. Maybe St. Martin could shadow each age group of basketball players to get a better sense of their point of view and incorporate that into his next book. St. Martin attributes the high rate of free throw shooting errors in the tallest of NBA players to large amounts of variable body movement, which definitely influences accuracy. His instructions lay out techniques to control all movement, especially the amount of space between the ball and the palm of the hand. He also covers the mental aspects in chapter seven (Mind Games), advising readers to “stay away from things that alter the mind or body.” Again, this social point can imply a sign of modern social times in our current drug-laced/caffeine-filled culture, though, to be fair, tobacco was more prominent in the past. St. Martin doesn’t include much detail about the most interesting world record he holds – most consecutive free throws (5,221), but does explain his physical regimen (a constant schedule of push-ups) and various other records (most free throws within a consecutive 24-hour time period, 84 consecutive three-pointers in eight minutes) that give readers a general idea of how the records are broken. A day-by-day memoir of this record-breaking experience would’ve made a great appendix. The author drops plenty of famous basketball player names (too many at times for such a short book) though in other sections, the author doesn’t give himself enough credit. I attended his halftime shooting show at a 1989 NBA exhibition game in Toledo, Ohio between the Detroit Pistons and Boston Celtics where he made 20 out of 20 free throws with a full crowd plus Larry Bird and Isaiah Thomas watching. If that’s not pressure, I don’t know what is. Plus, he inspired my brothers and me to improve our shooting game. We can still make more than 20 free throws in a row before missing. I still have the program to that game too… if St. Martin doesn’t already have one, maybe he would appreciate it more than I do. This quality title bumps the rim a little with personal tangents and opinions, but eventually swishes through the net with practical gems. Though short in length, this book captures the love of basketball for all ages with invaluable instructions that can improve anyone’s skill level. 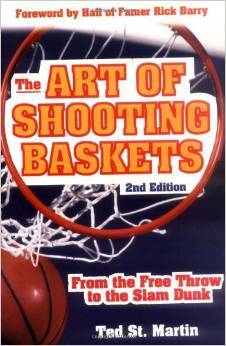 This book also includes a foreword by NBA star Ricky Barry, a prolific free throw shooter himself. This entry was posted in Book Reviews and tagged basketball, Books, Michael Siebenaler, Mike Siebenaler, Tall Writer. Bookmark the permalink.